Is your wooden deck looking old and a little tired? You may find yourself hoping for a nice weekend when you can work on it to make it look as good as new again. However, before you pick up a paintbrush or buy anything at your local hardware store, it’s important that you know exactly what you’re going to do to your deck. 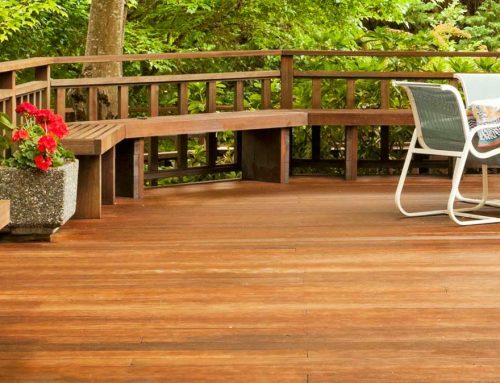 To keep your wooden deck looking great, you’ll have to do some maintenance every once in a while. 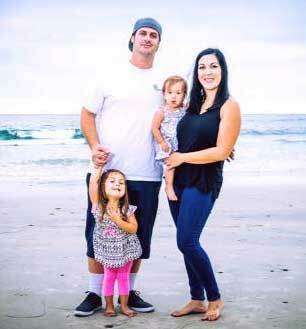 With that in mind let me help you define both the pros and cons of either painting or staining wooden decks. When done well, painting your deck can result in a great finish that will be easy to clean, protect the wood, and match any home. If you want a natural-looking deck, then paint is not for you as it will completely cover the wood grain and change the look of your deck; however, many homeowners paint their decks and are thrilled with the final results. A painted deck is a breeze to clean as long as it was allowed to cure properly and the paint used was of high-quality and does a great job of resisting damage from rot, sun, and mold. Before you pick up some outdoor paint, you do need to consider the cons. Once you paint your wooden deck, there is no going back. It would take a lot of time and effort to completely remove the paint from your deck and there is no guarantee that you would be able to remove it all. In addition, a painted deck can be slippery after it has rained and this can be very dangerous for residents, especially children and the elderly. Just as paint does, stain has a number of pros for your wooden deck. You’ll be able to enjoy the natural look of your deck, which can be gorgeous and add a lot of value to your home. In general, stain is easier to apply than paint is. It won’t be as obvious if you miss a spot or put on stain a little thick or thin in some places. You will have to perform more regular upkeep than if you had painted, depending on the quality of the stain you use and the application. You won’t be able to fill any cracks or stick down splinters in the wood. Consequently you’ll want to start with a well-constructed wooden deck before staining. Staining wooden decks usually makes them look more rustic. Some people love this look and search it out, while others shy away from it. 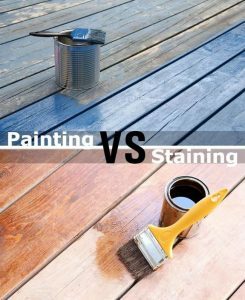 Both paint and stain will offer protection for your wooden deck and help extend its life. Ultimately, the quality of the products you choose and how you apply them will play a large role in the appearance of your deck and how long it lasts. Both require upkeep and have pros and cons as I’ve explained above, so the final choice is up to you.